I am awful when it comes to taking care of myself when it comes to the sun, and I won't lie I love getting a tan because I am typically the colour of paper. Which leads to getting burnt, bright red skin that needs a little TLC. 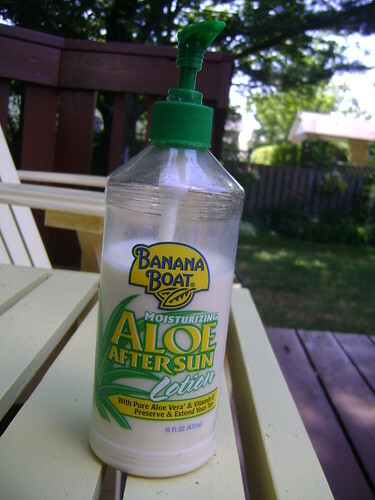 And I present to you the Healer: Banana Boat Moisturizing Aloe Aftersun. I slather this stuff on morning and night and if the burn is really bad, whenever it starts to hurt I slap some more on. It keeps me from peeling and sets into the skin pretty quickly. Just try it out, its inexpensive and can be found in most drugstores and although I do not recommend putting it on your face as it makes it shiny, when you are desperate, you are desperate and it didn't cause any breakouts on my face!